Enter the world of Downward, a first-person parkour adventure set in the Medieval ruins of a post-Apocalyptic world. The Earth's equilibrium has been destroyed. Use the techniques of wall-jumps, wall-runs, climbs, sprints and more to traverse the altered lands and escape from the many dangers you will face. This world is your kaleidoscope. Freely explore and enjoy breathtaking landscapes, reach secret places to collect useful items and hidden treasures. Most of the living have perished, but that doesn’t make the world quiet. Dark enemies will wake from their slumber to end your journey. Acquiring new abilities will allow you to double your jumps, use a metaphysical slingshot, teleport -- all transforming the way you see the world. Access a safe world in an astral plane where you can practice parkour and test your might with many challenges. Your true powers lie within. 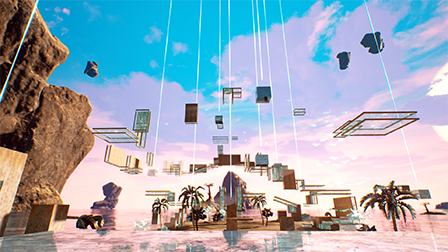 Command the sky to influence the environment, affecting both visuals and parkour. Distort gravity, control heat, or summon floods... your surroundings may be your only ally.